To create a Listing Pricing Plan, click on the Pricing Plans link under the Paidlistings Setup menu. 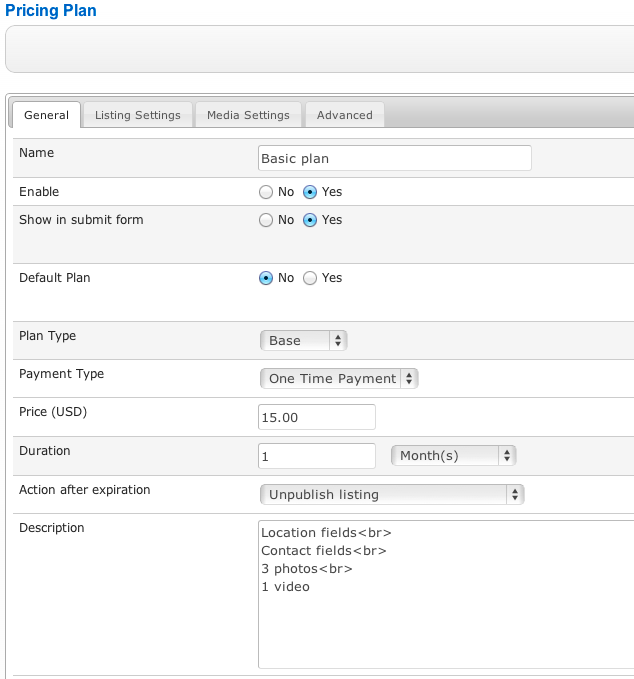 Enable - must be set to Yes if you want the plan to be available for purchasing. Show in submit form - allows you to hide the plan from the list that appears after category selection. This can be useful in implementations where new listings are free (an example is available in the FAQ section of this manual). Default Plan - appears pre-selected in the order page. There can be only one default plan of the same type (base or upgrade) per category. Base - a base plan that will be available only for new listings and when existing base plan expires. Upgrade - an upgrade plan that will be available only for listings that have a certain base plan applied to add more features to the base plan before it expires. One Time Payment - the user makes a single payment when ordering a plan for the first time. After the plan expires, the user will need to go through the process of paying for the next period again to keep the listing published. Subscription - subscriptions are handled by payment processors. Currently, only PayPal supports subscriptions (recurring payments). When the user orders a subscription plan, PayPal will setup recurring payments and after the plan expires, the user will be automatically charged for the next period. The subscription will run until the user cancels it in Paypal. Free or Trial - the user doesn't have to pay anything. When adding a free or trial plan with an expiration remember to setup a paid plan for the same categories so users can keep their listings published. Free/Trial Limit - if you select Free or Trial as payment type, you can limit the number of times this plan can be used with different listings. Leave empty for no limit. If the base listing plan never expires - you can set any duration for the upgrade plan. if the base listing plan has an expiring date - you must set "Never expires" for the upgrade plan and it will expire together with the base plan. Action after expiration - choose if the listing will be unpublished after the plan expires or a new Free/Trial plan order will be created. Description - use this field to to provide more details regarding the plan, it will be displayed below the plan name on listing submit page and the plan overview page. Moderation - if set to Yes, new listing will be left unpublished until approved by admin, even if the user paid for listing submission. Featured - if set to Yes, the submitted listing will become Featured. 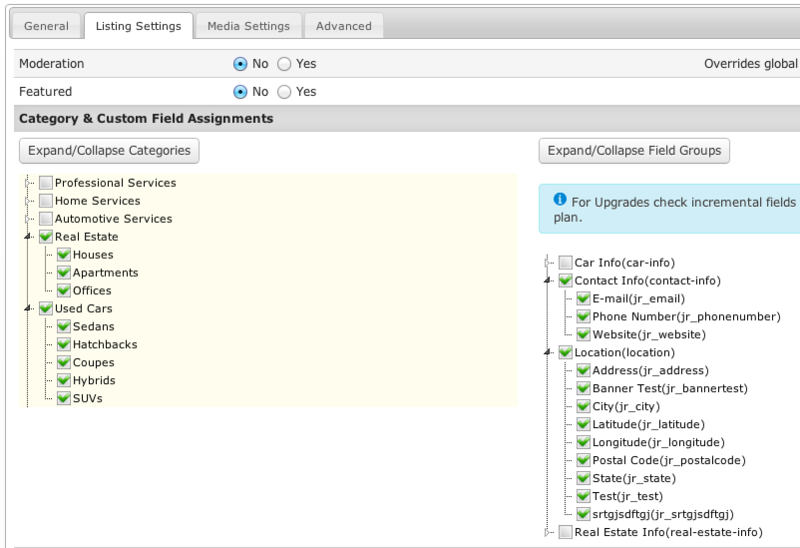 Category & Custom Field Assignment - first choose for which categories the plan will be available and then you will be able to choose which custom fields will be included. Enter the total number of media items that users will be able to upload for each media type. 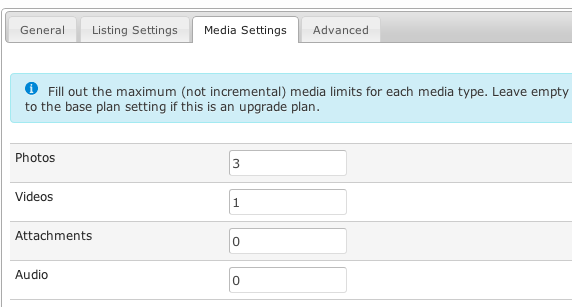 Leave empty to use the global media count setting for each media type or to default to the base plan setting if this is an upgrade plan. Custom variables provide additional flexibility to your pricing plans. The variables are made available in the theme files so you can use them for customizations. For example, you can show/hide specific page elements based on the variables that are included in the plan. For more info and examples, read how to use custom variables.